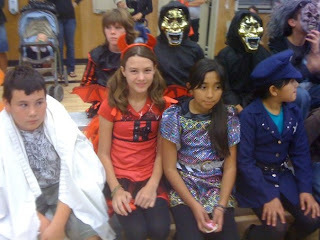 Mom Taxi Julie: School Halloween Parade-On it's last leg? I'm sure everyone is tired of hearing about all the kiddies Halloween crap. But :sigh: I'm behind so I'm showing you all now. 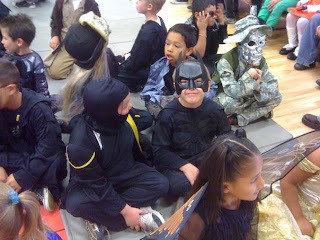 I took the day off Friday so I could go to the little kid's halloween parade at school. I keep waiting for the year where they yank this away from them but so far it hasn't happened. It seems as the years go on they take more and more "fun" things away from the kids. Last year it was the classroom parties. Booohiissssss. Of course they don't come right out and say they are doing away with the parties. They just make the days you would normally have a party a minimum day and then declare it "not enough time" to have a party. Yeah sure I'm not buying it!! I think they just don't want to bother with them. And they used to be so much FUN!! 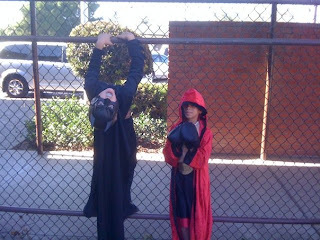 When my oldest was first in this elementry school I formed a great bond with the other mothers at the class room parties. The other kids? I barely know the other parents. I don't think that's a coincidence. (spell check where are you, I think I spelled that wrong!!). ANYHOW, enough of my rant. Took the day off, oldest stayed home sick :faker: and then met up with my mom and my nephew at the school (mom took him out early so she could bring him). I only took a few pictures because as usual I only have my iPhone for a camera (that is going to change soon, going to at least get a nice cheap camera soon). After the parade we went to McD's with my mom and then swung by the grocery store for my mom to pick up a cake for the Club's party that night. She had an extra ticket she gave me (kids ate free) so I met up with her and my step dad and my mom's friend for dinner. I got Jess to come with us. 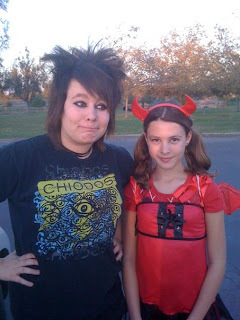 She was all stressed about wearing a costume for some reason and ended up just going as herself only with more eyeliner and bigger hair (hahaha she'd kill me if she read that).